Does this movie live up to its name? As a reboot and prequel does this film measure up? That's what Pablo Gunner is here to tell you and more. For those of you that don't know because I didn't is that "Rise" is just the first film in a series of three movies. I think they call it a "trilogy" in the biz. Knowing that Andy Serkis played Caesar I had to find out how the CG looked and how good of a job he as well as the rest of the actors did. If you're new to any of the Planet of the Apes movies or this one like I was I'll fill you in. Planet of the Apes is an alternate future where apes rule the planet as our superiors and owners. As said this is a reboot prequel that show how Caesar became the first superior ape. 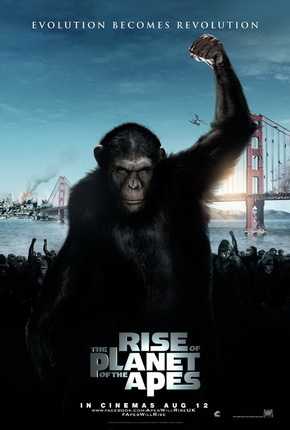 Considering that it's called "Rise" I assumed that this movie would show how ALL apes become superior and how humans become inferior in numbers. I felt that they could have done a better job explaining this but if you pay really close attention to the details and ending credit sequence you'll find the most of the answers. I found the journey to these answers to be quite interesting. Seeing how apes interact was really neat. It's always appealing to me as how similar we are to other animals. To be honest if I didn't know that Andy Serkis had played Caesar I wouldn't have known. Which brings me to the CG and acting in the film. Andy Serkis did a phenomenal job as Caesar. The CG and special effect of this film were so spectacular that it seemed all too realistic. James Franco played a pivotal character as Will Rodman, the scientist that creates the virus that stimulates brain function and raises Caesar. Franco did a good job not that he really had to make a big stretch. The whole cast was pretty solid but Andy Serkis was the real star. Personally I felt that this film was overall very impressive but the ending left me very unsatisfied and unresolved. Part of that was due to me not knowing that this was the first part of a trilogy and because I didn't pay attention to all the small details and ending credits sequence. I was one of those people that could not fathom or accept that apes could defeat us but by the end I was nearly convinced. So to answer my previous questions I do not think it completely lives up to the "Rise" part of the title. The Beginning or Beginnings of Rise of The Planet of The Apes would have made more sense to me. Also as a reboot and prequel it did a great job by not forcing you to know anything about Planet of The Apes. The action, story, CG, and talent of Andy Serkis make this a very strong, solid, must see RENT.